24.To the extent permitted by law and subject to approval by the relevant regulatory authorities where required, the Promoter may in its absolute discretion not accept a particular entry, may disqualify an entry, or cancel the entire Promotion at any time without giving reasons and without liability to any entrants. Prize must be taken before 2nd November 2019 and is subject to booking availability. Prize must be before 2nd November 2019 and is subject to booking availability. winner for this prize will be selected by a panel of judges based on what the judges consider to be the cutest and most imaginative wish, as submitted at the time of entry. prize will be awarded as cash. Prize must be taken by 2nd November 2019 and is subject to availability of requested items/services in the winner’s area. prizes in this prize pool will be awarded via weekly draws. (Prize Pool 1 / options 1 to 5) or tell us your child’s special wish (Prize Pool 1 / option 6). Winners of options 1 – 5 will be determined based on random draws. 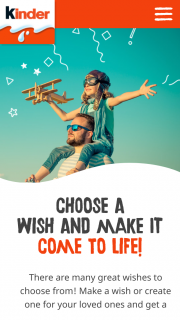 winner of the special wish (Prize Pool 1 / option 6) will be chosen based on what the judges deem to be the cutest and most imaginative wish, as specified on the entry form. Prize Options 1-5: Entries will be divided into groups in accordance with the major prize option selected by the entrant at the time of entry. prize draw will occur for each group for major prizes 1-5 at 11:00 AM AEDT on 02 Nov 2018. prize allocated for that group. 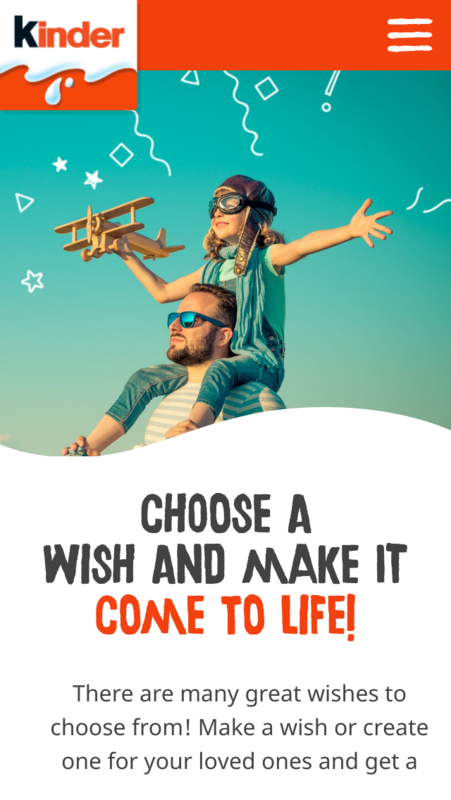 winner of Option 6: We’ll Grant Your Wish will be chosen by a panel of judges from 11:00AM AEDT on 02 Nov 2018, based on what the judges consider to be the cutest and most imaginative wish. winner of this prize. prizes available in this prize pool where Woolworths is nominated as the store of eligible purchase. prize draw will occur 11:00 AM AEDT on 02 Nov 2018.
winners indicated above that are first drawn in each draw will each win a Kinder Gift Pack valued at $100. Winners will be notified via Email (and Telephone where required) within two (2) business days of draw. prize winners will be notified via Email (and Telephone where required) within two (2) business days. prize details form part of these terms & conditions (Terms of entry). prize suppliers) and contractors (and the immediate families of directors, officers, management, employees, suppliers and contractors) of the Promoter and of its related bodies corporate, and of the agencies and companies associated with this Promotion, including the competition permit providers TPAL (Trade Promotions and Lotteries Pty Ltd) are ineligible to enter. prize pool is specified in the Total prize value section of the Schedule. prize is valued in Australian dollars unless expressly stated to the contrary. prize winnings and they should seek independent financial advice prior to acceptance of their prize(s). Prize draw details. prize, the prize will be awarded to the first reserve entry drawn. prize can’t be awarded to the entrant drawn, the promoter will then continue this process until the prize is awarded. winner does not need to be present at the draw unless expressly stated to the contrary. winners and Notification of unclaimed prize winners (if applicable) sections of the Schedule. winners will be deemed to have occurred on the later of the time the winner receives actual notification from the Promoter or two business days thereafter. prize winners who have not provided correct or complete contact details. prize that the winner must comply with all the conditions of use of the prize and the prize supplier’s requirements. prize must be taken as stated and no compensation will be payable if a winner is unable (through no fault of the Promoter) to use the prize as stated. prize draw time and date and subject to any written directions from a State lottery agency, the Promoter may conduct an Unclaimed prize draw(s) in accordance with the Unclaimed prize draw section of the Schedule (if applicable). prize draw takes place, the Promoter will attempt to contact the winner(s) of the Unclaimed prize draw in accordance with the Notification of unclaimed prize draw section of the Schedule, and if applicable, the name and State/Territory of residency of any winner(s) of the Unclaimed prize draw will be published in accordance with the section of the Schedule entitled Public announcement of winners from unclaimed prize draw. prize is no longer available the Promoter may substitute with a prize of higher or equal value “subject to any written directions from a regulatory authority”. prize conditions: Additional spending money, additional meals, taxes (excluding airline and airport taxes), insurance, passports, visas, vaccinations, transport to and from departure point, additional transfers, items of a personal nature, in-room charges and all other ancillary costs are not included. Prize is subject to booking and flight availability. winner and their companion are responsible for ensuring that they have valid passports, and any requisite visas, vaccinations and travel documentation. winner and their companion must depart from and return to the same departure point and travel together. winner but in the event that agreement cannot be reached, the Promoter reserves the right to determine the itinerary. winner may be required to present their credit card at time of accommodation check in. Prize is subject to the standard terms and conditions of individual prize and service providers. prize values are in AUD. prizes, including any Warranties which may have been made in the course of advertising or promoting the Promotion. prizes may involve third parties, and, to the extent permitted by law, the Promoter makes no Warranties and disclaims all liability in connection with any such third parties, their acts or omissions. prize, or using or permitting any other person to use the prize, except for any liability which cannot be excluded by law or which would cause any part of this clause to be void or unenforceable. prize claims and entrants and to disqualify any entrant who submits an entry or prize claim that is misleading or not in accordance with these Terms of entry or who manipulates or tampers with the entry process. winner breaches these Terms of entry, the winner will forfeit the prize in whole and no substitute will be offered. prize, are not transferable or exchangeable and cannot be taken as cash. prize is unavailable for any reason, the Promoter may substitute the prize for another item of equal or higher value, subject to any written directions from a regulatory authority. prize value (including between advertising of the Promotion and receipt of the prize). winner does not take the prize by the date specified by the Promoter, the prize will be forfeited. prizes, including to third parties involved in the promotion, such as contractors and agents, and any relevant authorities. To win one of our 6 major prizes, as well as the chance to win one of our weekly ‘Kinder Gift Pack’ minor prizes, and our Woolworths specific prize.